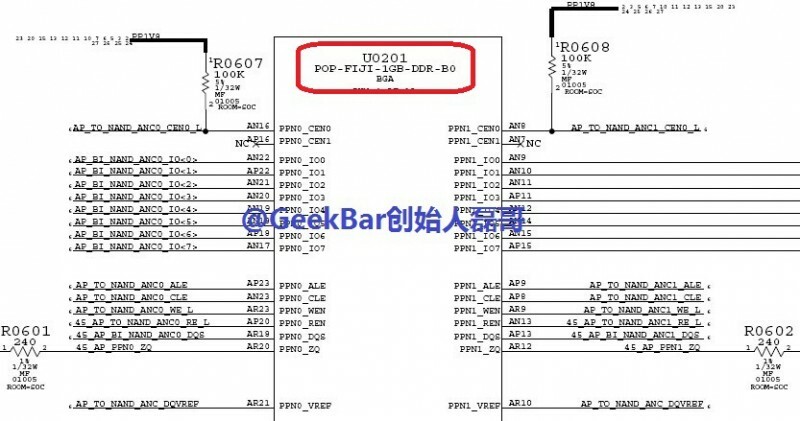 Apple's forthcoming iPhone 6 may sport 1 GB of RAM, according to a leaked schematic shared by Chinese Apple repair firm GeekBar (Google Translate, via G for Games). The chart is said to come from an internal supply chain source, however it is unknown if the schematic is intended for the 4.7-inch or 5.5-inch iPhone 6. If the chart is indeed legitimate, the iPhone 6 would join the iPhone 5, iPhone 5s, and iPhone 5c in sporting 1 GB of RAM. That amount of RAM would also be below competitors such as the Samsung Galaxy S5 and HTC One M8, which both feature 2 GB of RAM. It is important to note that Apple has never emphasized the amount of RAM in the iPhone, instead choosing to focus on optimizing the user experience through tight software and hardware integration. Apple is expected to announce the iPhone 6 at an event on September 9, with a launch for the 4.7-inch version likely coming around a week later. It is possible that the 5.5-inch version may also be launched at the same time, however reported production issues with the larger device may cause Apple to delay its launch until later this year or early next year. Both models of the iPhone 6 are expected to feature a thinner, curved design and come with a faster A8 chip, a new camera with stabilization, and iOS 8. Update 7:19 AM: As noted in our forums, the schematic's references DDR and NAND suggests that it more likely refers to some aspect of the device's flash memory rather than DRAM included within the A8 chip. Can't say that I'm surprised, though disappointed. Great. I own an iPad Air and the RAM is just insufficient. Apps keep reloading while multitasking . I often lose progress and need to retype stuff, like for instance I was searching tyres on ebay and set all the parameters for my car . I switched to safari to look up something. Switched back to ebay and it relaunched the ebay app and I had to do all the search again. But I guess its ok for the iSheep. Clearly I am using the device wrong. And 1 GB of RAM is more than enough. Price increase for 1gb ram and a small battery again.. Amazing so far. I agree on that software/hardware is great and works great. But more ram is what we need as well. Just try to hold open some safari tabs....or multiple apps....they will just close. 3 years of the same RAM and with a price increase, ouch. Keep the sharp objects away from MacRumors. I'm happy as long as the iPad gets a RAM upgrade. Seriously, can't look at different tabs without it reloading. Irrelevant but cue people going crazy over it. This looks like a NAND Flash Chip, not DRAM, based on the nets names. NAND flash chips use double data rate so that is why it says DDR. I wouldn't panic over this leak because it says nothing about the application processor's DRAM. Don't worry. There's always iPhone 6S next year! 1GB? Welcome to 2009... no wonder browsing and multitasking on an iPhone is horrible.